No early eastern American was more a man of the west than George Washington. In 1754, when just twenty-two, the already experienced surveyor was Virginia's choice to establish a claim to the region west of the Alleghenies, a region that was also claimed by Pennsylvania. Forced on July 3, 1754, to surrender Fort Necessity to the French, he inadvertently started a nine-year war between France and Britain that spread across the world and involved all the major European powers. Washington made several trips west both before and after the Revolution, surveying lands and claiming some of the best as a reward for his revolutionary and surveying services. Other properties he acquired by purchase. 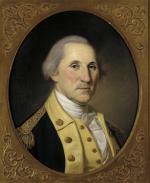 George Washington, by Charles Willson Peale, 1787. By the end of the War for Independence he owned about 58,000 acres of western lands in Pennsylvania and what is now West Virginia. Washington believed that the woods of western Pennsylvania and the Ohio Valley beyond would one day become part of a great American nation. But the retired general also feared that unsupervised settlement could lead to disaster. Poor families moving onto the land, and beyond control of eastern elites, could lead to Indian wars, and an uncouth democracy whose weak commercial ties with the east could lead to calls for secession from the Union, or annexation by Spanish Louisiana or French Canada. In September 1784, Washington traveled into western Pennsylvania to survey the 2,813 acres the British government had awarded him for his service in the French and Indian War. There, families had already settled on some of his lands, and the general feared that the loss of even a single parcel to squatters would have a cascading effect, and that he and other legitimate investors might lose hundreds of thousands of acres. Washington also hoped to attract settlers to western Pennsylvania as part of a tremendously ambitious plan for development of the new nation. The retired general was planning a grandiose scheme of canals and roads that would link Lake Erie to the Ohio River to the Potomac River to the Atlantic Ocean, a system that would carry the wealth of the nation's interior to himself and his home state of Virginia. 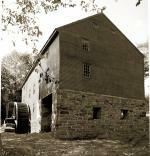 Washington's Grist Mill in Perryopolis. When Washington arrived at his Pennsylvania properties in September, 1784, he was met by a group of Scotch-Irish Presbyterians led by David Reed, who had already settled upon and laid claim to the lands given to him by Congress. When these squatters had arrived in the early 1770s, the area was a trackless forest, still considered by many to be part of the sprawling colony of Virginia. These frontier families had cleared the land; built fences, log cabins and barns; and endured the risk of Indian attacks. They had grown their own corn and wheat, raised cows and pigs, and hunted wild game. Now, years later, they were being confronted by an absentee landlord, who had kept track of every acre he owned and every shilling of rent he was due. Operating on the assumption that those who improved the land had stronger legal and moral claim to ownership than someone who simply possessed a paper title, they refused to grant Washington occupancy and were unimpressed by his revolutionary war credentials. 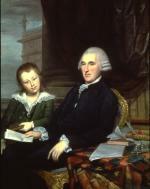 Governor Thomas McKean and Son, by Charles Willson Peale, 1787. Calling themselves the Covenanters, they identified themselves with the Scotsmen who in the 1640s had opposed King Charles I' efforts to tax and rule them without their consent. Washington, on the other hand, saw himself as the victim. Unlike other speculators such as Robert Morris, Henry Knox, William Bingham, and the Holland Land Company, Washington actually took pains to physically visit and attempt to settle and organize his several holdings. He also knew that squatters frequently sold land to which they had no real title. 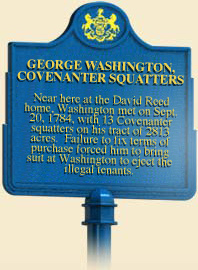 Washington was convinced that the squatters had taken advantage of him, penalizing him for the years he had led his country's army in its fight for independence. "Indeed, comparatively speaking I possess very little land on the Western Waters," he wrote to his attorney. "To attempt therefore to deprive me of the little I have, is, considering the circumstances under which I have been and the inability of attending to my own affairs, not only unjust, but pitifully mean." He had little sympathy for this "grazing multitude," who "set forth their pretensions" to his land, and attempted to "discover all the flaws they could in my Deed." On September 14, 1784, Washington and the squatters faced off near his gristmill at present-day Venice. After explaining their respective positions, they agreed to meet again in a few days. Doing his best to salvage the situation, the general met again with the squatters, who again refused to recognize his ownership. 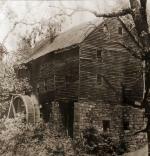 George Washington's Grist Mill, Perryopolis, Pa., early 1900s. The ensuing lawsuit dragged on for two years. In October, 1786, Pennsylvania Supreme Court Justice Thomas McKean, riding circuit in the western part of the state, presided over the trial in Washington, Pennsylvania. When the jury came back with a verdict in favor of the general, he became the proprietor of thirteen separate plantations. Washington showed some mercy by absolving the squatters from twelve years of back rent. Permitting the squatters to keep their plantations, he only demanded that they pay future rent. But the squatters would have none of it. Abandoning the homes they had built over many years, they all moved away. Several obtained warrants for land adjacent to or near Washington's land, cleared it, and built new plantations. Washington would keep his grip on the land for another decade. In 1796, with western land speculation in full collapse, he sold the entire tract to a local agent for the modest sum of $12,000. When the agent defaulted on the mortgage, the general then retained the land until his death. Joel Achenbach, The Grand Idea: George Washington's Potomac and the Race to the West (New York: Simon and Schuster), 2004. Charles H. Ambler, George Washington and the West (Chapel Hill: University of North Carolina Press), 1936.